Castlehold is the name for part of Upper High Street Newport which was part of the Parish of St Nicholas with the parish church St Nicholas located in Carisbrooke Castle - thirteen areas scattered across the Island made up the St Nicholas parish. The original Castlehold was roughly half a block either side of the High Street from the corner with Mill Street to about three quarters of the way to St James Street, slightly less on the south side. Later, after it was absorbed into the Borough of Newport, Castlehold was still used but the extent became less clear, Newport Baptist Church is referred to as being in Castlehold but is outside the original area. Depending on the authorship and date, reference to Castlehold could be taken as meaning from the junction with Pyle Street to Post Office Lane/Castlehold Lane or alternatively the complete Upper High Street from Drill Hall Road to St James Square. 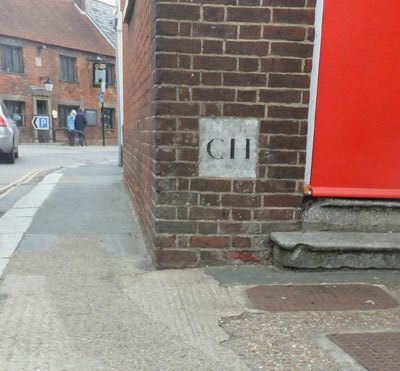 Today (2016), a Castlehold boundary stone can be found built into a building in the Upper High Street, just below the Upper Almshouses.